S. MacDonald, G. Eaton, G. Smith(coach). J. MacLellan, K. Warren, A. Smallman, W. Oliver, C. Christie. Here are some wonderful examples of Knee Pads. 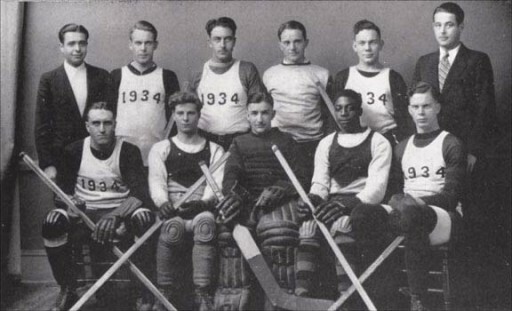 J. MacLellan (bottom left) is wearing Leather Knee Pads. and W. Oliver (second from bottom right) is wearing another form of felt Knee pads. C. Christie (bottom right) is wearing Knee/Shin Pads beneath his stockings.